Streetlights decorated with lighted garland and red velvet bows are an annual source of pride in Frankfort. But city superintendent Joshua Mills had even more reason for good cheer last December when he scanned the lights along Main Street in the small northwest lower Michigan community. That’s because Frankfort is now saving roughly $3,000 on its annual light bill as a result of a streetlight survey conducted by Consumers Energy. Mills is pleased to add dollars to the city coffers. What’s more, he now has an accurate account of his community’s 400 streetlights and is working with Consumers Energy to develop a plan for transitioning them to more energy-efficient options in the future. Frankfort is far from alone. Consumers Energy is helping communities across Michigan keep its streets lit affordably while making the transition to more efficient lamps. 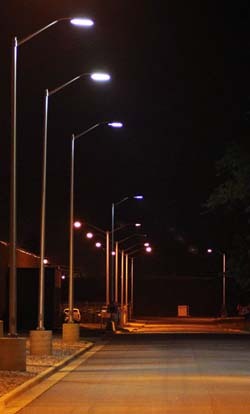 The company’s efforts stem largely from the Federal Energy Policy Act of 2005, which mandated the gradual phase out of mercury vapor streetlights. The intent of the federal law, which bans the manufacturing or importing of mercury vapor ballasts, was to reduce mercury pollution, save energy and money and reduce greenhouse gas emissions. Roughly 70,000 mercury vapor streetlights currently are operating in Consumers Energy’s electric service territory. Most are owned and maintained by the company. Eventually, those lights must be switched to more efficient — and in some cases more expensive — alternatives. Consumers Energy estimates the transition could take up to 10 years. Some communities may face upfront costs, depending upon whether they choose to switch to high-pressure sodium or LED lamps. Consumers Energy is helping small and big municipalities alike prepare for the change. The first step in the lighting transition process is a comprehensive streetlight survey. In 2009, Consumers Energy started working with municipalities to take complete streetlight inventories. The goal is to confirm how many streetlights are in each community, what type of bulb they use, who owns them and who is responsible for maintenance. It’s not easy — or fast. Maps in hand, interns and employees must verify every light in a municipality. In many cases, they also must perform a night survey to determine the types of bulbs, which give off different colored glows. Another challenge is determining which municipalities are responsible for streetlights on the borders of communities being surveyed. The company has completed more than 30 surveys and currently is working on 55 more, said Linda Marklin, team leader of the statewide streetlight project. From start to finish, the surveys take about six months on average. But the time and effort are a solid investment, Marklin said. Once a community develops a lighting transition plan, the company will use it to implement the specific changes. In some cases, the surveys have resulted in refunds to municipalities. That’s appreciated in places such as Frankfort, which already uses high-pressure sodium streetlights but is working with Consumers Energy to understand the benefits and costs of upgrading to even more efficient lighting. For more information, visit www.consumersenergy.com/streetlighting.